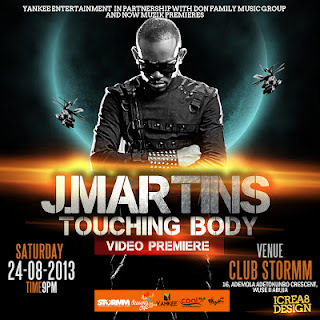 Attention Abuja:"Touching Body" Video By J.Martins Premieres At Club Stomm!! Abuja music lovers your attention is urgently needed as News reaching us from G-Money Entertainment with a big bang! (no casualties sha!) J.Martins "Touching Body" video premieres at club stormm Wuse 2. Yankee Entertainment & Club Stormm in partnership with Don Family Music Group and Now Muzik Management present the video premiere of J. Martins smashing urban afro-pop hit single "Touching Body" at Club Stormm on Saturday (24-8-13). Address: 16 Ademola aAdetokunbo Crescent, Wuse 2 (beside new DSTV office, behind Transcorp Hilton), Abuja. Powered by : Jaguda.com Cool FM, Wazobia FM, G-Money Entertainment and Exclusive Stores.